VroomVroomVroom can help you find a cheap car rental in Canberra. We compare rental cars from major brands including Hertz, Budget, Avis, Thrifty, Europcar and Enterprise. Just filter the result by price to easily find the cheapest car hire. Canberra is Australia's capital city, located on Lake Burley Griffin. 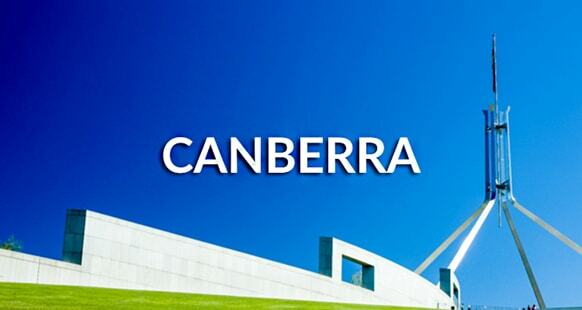 There are many tourist attractions in Canberra including the city's famous museums and the majestic Parliament House. One of the most popular tourist spots in Canberra is the Brindabella Ranges, which act as a beautiful backdrop to the city. The best way to see Canberra's tourist attractions is with a hire car. It gives you the freedom from travelling from one place to another. Wide selection of vehicles to choose from including campervan rentals. Convenient drop off and pick up locations to choose from. Expert customer care team available to assist you. Contact us now! There is always something going on at Canberra, so there is no bad time to visit. Expect colder temperatures if you visit through winter, with daily averages of 12 degrees. Frosts are common of a morning during this time. If you are planning on outdoor activities consider visiting in summer when the weather is warmer. Canberra is busy in early January for the annual Summernats, an event for motor enthusiasts. Many Australians visit the city in April for ANZAC Day, with the War Memorial hosting a number of events. In September the colours come out in Canberra for Floriade, a popular floral display attracting visitors from around the country. Before heading out in your car hire, check here for live traffic updates and avoid any congestion. There are no toll roads in the city, and parking is plentiful. Be aware of parking signs to avoid getting a ticket. If you are travelling to other Australian destinations make sure you prepare for longer driving distances. It is just over three hours to Sydney, and more than six hours to reach Melbourne. If you are travelling long distances it is a good idea to check the weather forecast so you can prepare for the conditions. Click here for more driving tips in Australia. VroomVroomVroom is not only a wealth of knowledge about good value hire cars, we like to offer our customers our wealth of knowledge about Canberra. We give you the Canberra top attractions to make your holiday the biggest and best holiday ever! We have chosen some of the top things you can do and places where you can stay, check out our guide below for things to in Canberra. 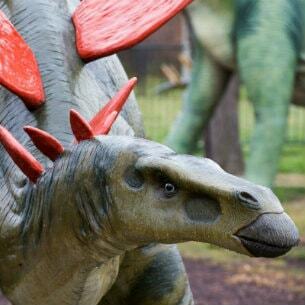 The National Dinosaur Museum houses the largest display of dinosaur and fossil materials in the country. The museum showcases life-like animatronic dinosaur models, as well as complete skeletons and fossils dating from the Triassic to the Cretaceous periods. The newest exhibit features a massive Stegodon, a relative of the woolly mammoth, and illuminates life after the dinosaurs. Visitors can navigate through hundreds of millions of years of the planet's past with the help of enthusiastic tour guides. Attracting over 100,000 visitors annually, the museum also hosts private parties and dinosaur-themed sleepovers during school holiday periods. Rocky Trail Entertainment organizes several mountain bike events in Canberra every year, ranging from cross-country endurance racing to downhill, and even the new gravity enduro format. They run these events at Stromlo Forest Park, one of Australia's most popular mountain bike parks with over 60km of single trails. Visitors can participate in Rocky Trail's endurance races. Or, watch the annual Downhill state series event that's all about big jumps. It includes the most technical downhill trails Stromlo has to offer. The park's facilities offer undercover picnic spots, a kids' playground and best of all -- a hot shower where visitors can freshen up after their ride. Any visitors to Canberra traveling with kids should put Questacon in their itinerary. Questacon has made science a very fun learning experience with its seven themed galleries, filled with over 200 hands-on exhibits. Kids can free fall down a six metre slide, experience an earthquake and star in a Spectacular Science Show. 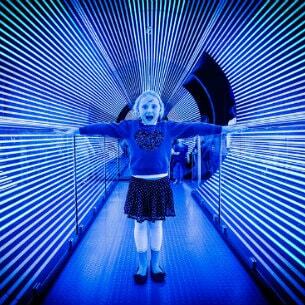 Probably Questacon's most photographed and most interesting exhibit is the Rototron, a walk-thru tunnel with LED lights that will make you feel like the tunnel is spinning. There is so much to see and discover at the centre. There's only so much that can be written about it, but it's fairly certain that your kids will beg you to come back to Questacon. This family owned and operated hotel offers a choice of 76 hotel rooms and 40 serviced apartments. 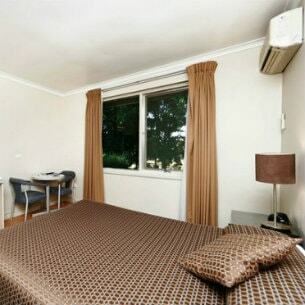 What makes Forrest Hotel and Apartments great, aside from the welcoming atmosphere, is its ideal location. The hotel is situated in the green suburb of Forrest and is just minutes away from the city's central business area and most popular tourist destinations. Guests can unwind and dine at the hotel's own Sherwoods Restaurant overlooking leafy parklands. If you're looking for the finest accommodation, East Hotel is the perfect place for you. This hotel has received another Certificate of Excellence Award from TripAdvisor and is ranked number 1 among 52 other hotels in Canberra. The 4-star hotel is situated in the heart of the central business district and is just walking distance from tourist spots and posh restaurants in Manuka. 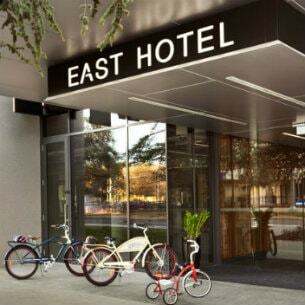 East Hotel offers 140 spotlessly clean rooms with its own gourmet kitchen, wireless internet, and high-end appliances. Guests with kids can avail the Kids Studios complete with bunk beds, bean bags, toys, and an Xbox with the latest games. Boasting Canberra's best butter chicken, Indian Affair in the City is a family owned business. This restaurant serves only the very best quality of authentic North Indian Cuisine. With a boutique beers on tap and an extensive cocktail list they have something to excite every palate. Located downstairs on Akuna Street Digress Cocktail Bar has become one of Canberra's premier entertainment venues. With entertainment every night of the week together with a $10 curry and rice special you are bound to find something you love! Experience a little Paris in Canberra. Try the $17 weekday lunch special, or treat yourself to their Saturday lunch special, $50 for a 5 course degustation experience. The restaurant focuses on fresh and seasonal produce. What else can you do with your Canberra rental car? Take a sail on Lake Burley Griffin. Eat your way around Manuka and Kingston. Explore the history of this nation through the War Memorial or a tour through the old and new Parliament House. Take a wander through the multi coloured fields full of tulips and other flowers during Floriade. Your options are endless in Canberra for things to do with your rental car so get exploring. Although the public transport system can probably take you where you want to go in the city area, having a rental car means you have the freedom to explore Canberra in your own time. With the National Museum, Library, War Memorial and also Parliament House, you are going to need all the time you have got to enjoy what the city has to offer. In the middle of the CBD area is a shopping centre that sprawls across a few streets. This is nothing but good news for the shopaholics amongst us. If you are that way inclined, make sure to select a model of rental car with plenty of boot space for stowing away your buys. There is also such a thriving fine dining culture in the city it would be a shame not to experience it all. Taking a walk through the CBD can give you many options on where to eat, but if you want something to write home about try a few of these places. Courgette on Marcus Clark Street, or try Jewel of India, Thirst or Mezzalira which are just some of the amazing restaurants on hand at the renowned Melbourne Building. This time I will be discussing Pialligo, Canberra. It's a rural suburb in the Australian Capital Territory where there's plenty to do and to see. The name Pialligo, which is of Aboriginal origin, has been used for this area since approximately some time in 1820. It was also the name for the parish in the area. The streets in Pialligo are also named with Aboriginal roots and this shows how important their culture and the language of their ancestors are important is to this place. Being an early site of Aboriginal campsites, Pialligo soon became residence to white settlers who started raising sheep and cattle and planting lush vegetables and gardens on the land. After the National Capital was established in the early 20th Century, Pialligo became known as the kitchen garden of the city. Agriculture flourished like never before! At the present, locals and tourists alike enjoy the scent of country living in view of Parliament House as they walk the streets, visit the orchards, vineyards, nurseries, garden and gift centres. You'll find out a bit later on in this guide just how much you can do in this amazing suburb! To make your visit to Pialligo a thousand times easier, think ahead and get yourself a good car rental from Canberra. I've got just the thing for you. A-mazing cars! Affordable prices! Quality and satisfaction guaranteed! Just use the search form above to compare car hire deals that fit your style and your budget! Now that we've addressed that all-important issue of car transport, let's move on to your travel itinerary. First up, treat your tummy with the mouth-watering culinary creations you'll get to feast upon at Pod Food. Nestled among the gardens of Pialligo plant farm, the charming, fully-restored 1930's cottage offers a one-of-a-kind dining experience close to the Canberra Central Business District. The grounds of Pod Food are split into three well-lit areas: the cottage, the deck, the garden terrace and the Gallery. These north facing areas are sunny and bright during winter and shaded in summer. This makes the boutique and modern venue perfect for whatever time and whatever occasion. Want to try a water sport that gets your adrenalin up and pumping? ACT Wakeboard, home of wakeboarding in the Australian Capital Territory, is the place for you then! This place encourages and facilitates better interaction among Wakeboarders from across Australia and around the world. It also serves as avenues for Wakeboarders so that they can improve their individual skills while promoting safe riding within the entire wakeboarding community. Tone the excitement down a little and set the mood for your trip back home. Take a relaxing pottery workshop tour and adapt a Greco-Roman archaeology, Scandinavian-inspired and Japanese-touched technique that's unique to the original ceramic designs of Bison Homewares. You're in for an artistic treat with this place. Why, hello again! How of you all been? I've had a fantastic day outside. Took a walk around my town and I'm pleased to see how well it's chugging along. People still smile when you walk by and the butcher still likes to chat even though he's mad busy with orders! Not quite like the situation in the city where people walk right past each other without as much as a glance. Some times people bump into you accidentally they don't even say sorry. If you hate that about cities then you'll find this inner north suburb of Canberra the perfect place to go on a vacation. It's just the right blend of city and suburb that includes lots of modest art galleries, a couple of mid-market restaurants, cafes and bars, voguish gift and clothes shops, and all that jazz! You also might be curious as to why the suburb is named as it is. Well, Braddon actually got its name from Sir Edward Braddon, a Federalist, legislator and a contributor to the writing of the Australian Constitution. Braddon tradition goes well on to naming their streets after a variety of things such as aboriginal words, legislators and pioneers. Right then, on to the best places to visit in Braddon. The first thing you must see is Braddon's commercial centre and you can find this at Lonsdale Street, one of Canberra's most exciting cultural centres! It's a shopper's dream, being residence to original Canberra designers, trendy Australian fashions, imported designer shoes and quirky handcrafted gifts and homewares alongside a tasteful collection of restaurants, car yards, and salons. If you want to have a pint or two while you're there, you have got to try The Civic Pub! Get to mingle with the locals because this is the most popular working-class pub in and around the city area. Just don't get too tipsy, yeah? You still have to drive in the morning! After the first night of merry-making and a good night's sleep, wake up and get ready to drive off to the glorious Haig Park! Its strongly formal design, comprising of exotic trees planted in parallel rows earns it the praises of 'unique' in Australian park design. It's quite an accessible park, perfect for most recreational pursuits. So go ahead and enjoy whatever you choose to do while being surrounded by the trees that put up quite a powerful presence. House Arts Centre. The Centre, which has always been a significant culture complex, admits intimate performance spaces, dance studios and workshops, a gallery (which you should definitely experience). It's a cool place to get a taste of local Canberra craft. A visit here promises the utmost artistic satisfaction so you best not pass up this opportunity! Now you know what to do when you get to Braddon. Do make the most out of your trip and if you want, you can write to me and tell me how it went. How does that sound? Feedback: very easy and simple to complete, great site! Feedback: Fast, simple, efficient. Really appreciate the service.